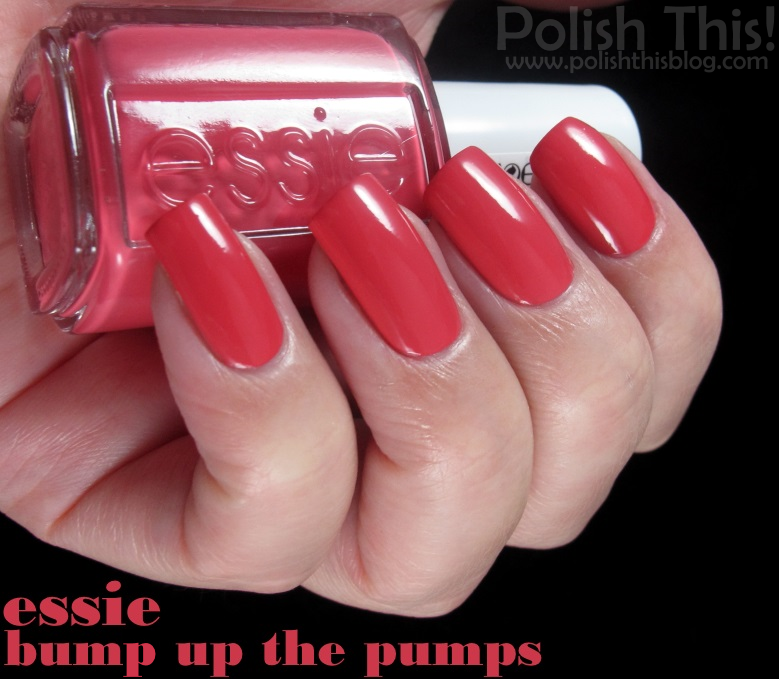 Essie Winter 2014 Collection - Swatches and Review - Polish This! Yay, I have my swatches and review of Essie's Winter 2014 collection called Jiggle Hi, Jiggle Low to share with you guys today! I only got these today for review and I wanted to do and share my swatches immediately since I was pretty excited about these. It has been a while since I had the opportunity to swatch a whole Essie collection because the last one that I got for review before this was Essie's sping collection. Sadly L'Oreal Finland didn't bring any of those summer or fall shades into the stores here in Finland this year, but I'm very happy that now we also have another seasonal collection here too. Of course I'm also so very happy to get to test it and share it with you also! This is a bit weird collection though since it's supposed to be winter collection but these shades are definitely not those traditional dark and muted winter colors or even those sparkly holiday colors that we are all used to see. So this is surely a different take on the winter color palette. I did all my swatches without any base or top coat. Also, keep in mind that the ones that I have are with that wider Essie brush that we mostly have here in Europe, so that of course makes a difference in applying the polish compared to that regular US thin brush. 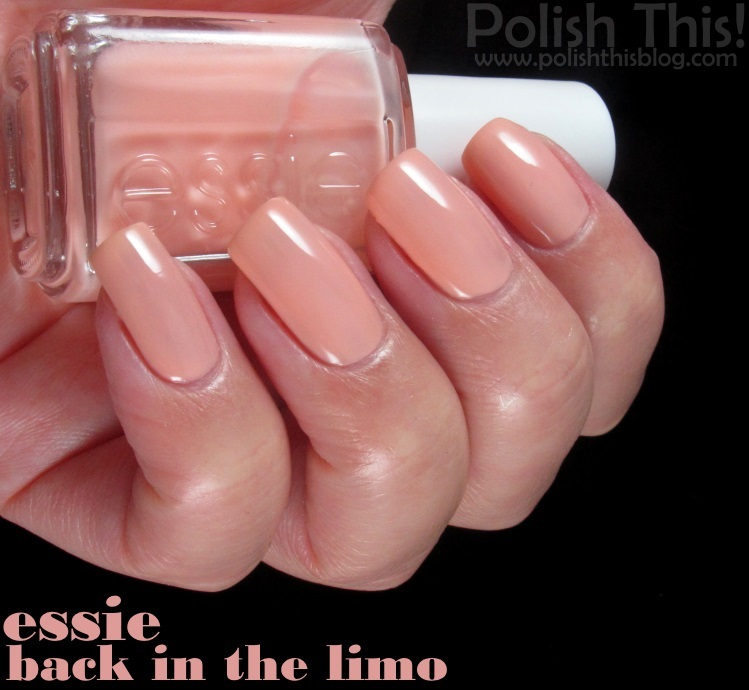 Back In the Limo is a beautiful apricot jelly, or rather crelly as it seems to be a mix between jelly and creme. Because of the formula I used three coats here and it's still not totally opaque, but close enough. This certainly doesn't look like a wintry color to me, but it's pretty nonetheless. This is super glossy even without a top coat and I love that juicy squishy look. However, I bet this isn't the easiest one to apply with that thin Essie brush because of the formula and the fact that it easily goes on a bit patchy. With the wide brush it was still very manageable. Bumb Up the Pumps is another color that doesn't really say winter to me. Anyhow it's beautiful pink based coral that worked pretty well with my skintone eventhough many other coral hues don't. This was almost one-coater though I did two here. Once again very glossy even without top coat and you really have to love that self leveling formula which makes this so easy to apply. Double Breasted Jacket continues with the hues that don't really look too wintry. Essie describes this as tourmaline red and this was once again one of those Essie polishes that have that really really amazing formula and quality. It's basically one-coater, I did two here. Eventhough at first I wasn't totally sold on this color the formula really won me over and I'm liking this very much. Jiggle Hi Jiggle Low is the namesake polish from this collection and it's really the kind you would expect finding from a winter collection since metallics seem to be really hot this season. I'm really loving this one, it's gorgeous silvery gold with some bronze flecks in the mix - beautiful! I needed two coats for full coverage and I'm so happy with the fact that this is brush-stroke free. Jump In My Jumpsuit is another color in this collection that you might expect from a einter collection - it's a deep berry red with some blue undertones. It's not really unique in any way, but it has that a-m-a-z-i-n-g Essie formula and quality. I used two really thin coats here, you could maybe do it with just one. Tuck It In My Tux is somewhat sheer ivory with jelly formula. I used three coats here and this isn't totally opaque with those either, but again I loooove that glossy and squishy look. With one or two coats this gives you more translucent effect, so it could work nicely with french manicures. Also this would be perfect for those glitter sandwich looks. This collection still left a bit baffled, I do like pretty much all the colors, but at the same time I don't really see winter here. Then again, I don't really know if it's so bad thing to do a seasonal collection with some other colors than those that we have traditionally used to see. I'm especially loving those two squishy jellys here, so Tuck It In My Tux and Back In the Limo are probably my favorites here. Also Jiggle Hi Jiggle Low is gorgeous and pretty perfect for the holiday season, so it's definitely another favorite of mine. I would have probably changed one of those red(ish) ones to some other color just to get more variety and because they really don't look too unique to me, except maybe Bumb Up the Pumps. Back In the Limo is definitely the most unique one here, at least I don't have anything similar! I also received those two new Luxeffects shades for review, but I'll show you those in another post. What do you guys think about this collection? Which one is your favorite? Disclosure: I have gotten all these polishes for review. For more information view my disclosure policy. Vihdoin Suomeenkin saadaan taas Essien kausikokoelmaa myyntiin, sillä uusi talvikokoelma Jiggle Hi, Jiggle Low on tulossa kauppoihin marraskuussa. Sain tämän koko kokoelman testiin sekä myös kaksi uutta Luxeffects sävyä, jotka esittelen teille myöhemmin. Kokoelman sävyt eivät totisesti ole niitä tavallisimpia talvikokoelmissa nähtyjä sävyjä! Omiksi suosikeiks näistä nousivat jellyt Tuck It In My Tux ja Back In the Limo sekä upea metallinen Jiggle Hi Jiggle Low. I like all those colors but they all look like Valentine's Day polish. These will be perfect for those Februaru manis and good for BCA this month too with the pink polish, but htey sure don't say "holiday" or "winter" to me at all. You're totally right, the colors look like Valentine's Day shades or BCA hues and they don't really say anything wintry, but for some reason I pretty much like them all. Not sure about them as a full collection though. Ehkä aika tylsä jopa? :D Hämmästytti tosiaan tuo pinkimpi punainen tuolla seassa! Ja voi ei, onko kohta siis talvi ja joulu:0 aika menee liian nopeasti! The jump in my jumpsuit is a beautiful one. Though they do not look like for winter, I think they are just perfect for everyday wear. Tää on kyllä tosi erikoinen kokoelma, en oikein tiedä mitä Essiellä on ajateltu. Äkkiseltään mikään ei oikein huutele pääsyä mun hyllyyni, mutta ehkä tuon Bumb Up the Pumpsin voisin kotiuttaa :) Swatchit on kyllä kauniit! Tää on kyllä jännä, jättää vähän sellaisen hämmentyneen fiiliksen. Monikaan näistä ei ole kyllä varsinaisesti uniikki, mutta kauniita ja laadukkaita lakkoja kaikki silti. Bump Up the Pumps on kyllä nätti! Mun mielestä on kiva kun tulee vähän erilaisia kausikokoelmia:) Ei aina tarvii olla samanlaisia sinisiä ja kylmiä sävyjä. Näistä tuo Back in the limo houkuttelee ehkä eniten, tosin tuo koostumus vähän epäilyttää..
Hi Annie, your swatches are so beautiful! Thanks for all the comments on formula -- that really helps us readers decide whether or not to buy. My own personal opinion is that these colors actually do represent "winter" to me -- red, white, silver? Classic Christmas and holiday shades. "Back in the Limo" could be for those gals who enjoy neutral or even pastel shades once the holidays are over, or for work-appropriate nails. "Bump Up The Pumps" is the only one that doesn't quite fit the theme for me, but it's a nice addition for contrast to the collection. I love that Essie's collections are traditionally smaller -- it's easier to make decisions about each polish for me that way. You're totally right about this collection, they surely are classic Christmas and holiday shades - red, white and gold/silver - just with a twist. I didn't even think about this in that way! I think this was surprising because of the fact that you would expect maybe some darker hues or some sparkle and metallic for the holidays, but then again, it's nice to see something a bit different once in a while. :) I agree with you also, I love the fact that Essie does these collections with six polishes, that's pretty much a perfect amount!